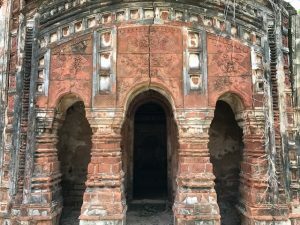 Joypur in Bankura district has its own glorious historical background and heritage. 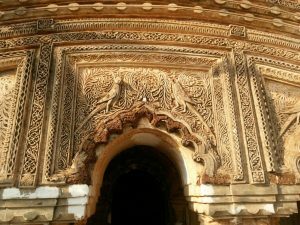 The famous Malla dynasty is stated to have been founded here in the late seventh century AD. Remains of the mighty kingdom can be found at large in the form of elegant laterite stone and terracotta temples, sculptures and idols. It is just overwhelming to note that rich archaeological and artistic treasures this small land possesses. 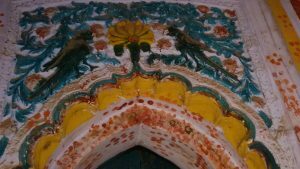 At the same time years of neglect has caused erosion, decay and sometimes theft of the local heritage and artworks. Utter lack of local heritage consciousness also added further damage. 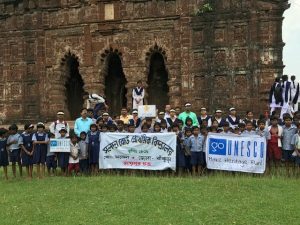 An awareness drive was much needed to draw the attention of the Government and the world at large including the student’s community about this ancient glory and SAVE LOCAL HERITAGE. 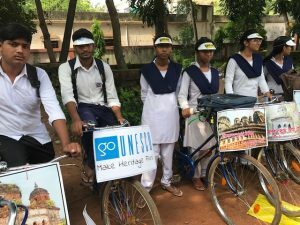 On 25th June 2017 for building awareness among local people about built heritage and its conservation, a massive cycle rally was organized under the guidance of INTACH, Kolkata Chapter. It was decided to cover at least the major ones. Pictures of the local heritage with Save Local Heritage imprinted on it were also distributed among them to fix in their respective cycles. The students of two high schools and one primary school participated in the rally. Along with them were local BDO of Jaypur Block –a great heritage enthusiastic, Headmasters of the schools, OC of the local PS and other dignitaries from Panchayet. Local heritage researcher and representatives from Intach Kolkata chapter were also joined. Above all , Honorable Minister Shri Shyamol Santra , MOS Dept of Panchayet and Rural Development who not only flagged off the rally, he led the entire programme from beginning till the end riding his own bicycle along with the students! 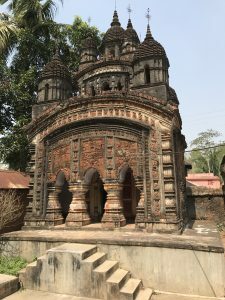 The first stop was at terracotta ‘Atchala’ temple near a market place which was practically covered by wild bush and lost forever. 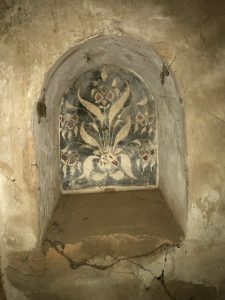 Some members from INTACH reinvented this in recent past and local initiative of an individual to save this built heritage brought a fresh life to it. After that the group reaches to another very old temple of Malla period which is cleaned up recently by local youth. After viewing these temples the rally reached to one of the forgotten wonder of the village. 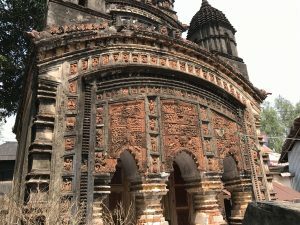 It is a nine pinnacle two tire temple of De families, exquisitely decorated with terracotta panels on all sides depicting the stories based on Krishnalila and contemporary social life. 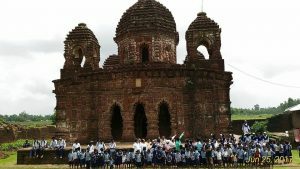 The heritage researcher from INTACH explained the stories in the panels and also pointed out the visible damages to the students. . Another Nine pinnacle temple with similar richness in terracotta all around , also mesmerized the students. In fact they were amazed to note that such treasures are lying next to their houses. 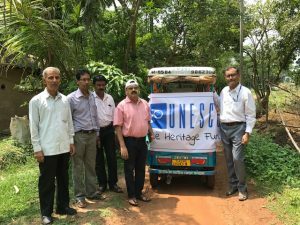 Then the group reaches to the largest full laterite temple popularly known as ‘Gokulchand ‘. 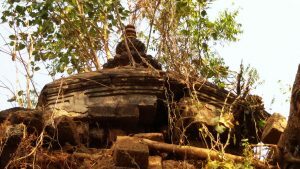 This is the biggest laterite temple in the District and was a frequent destination for Malla kings during their hey days, now under ASI protection. 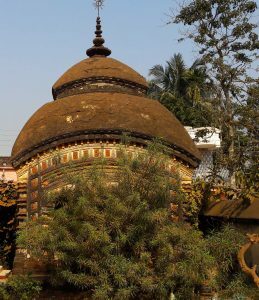 The presiding deity is shifted to Bishnupur for safety reasons and brought here once in a year during Ras festival. 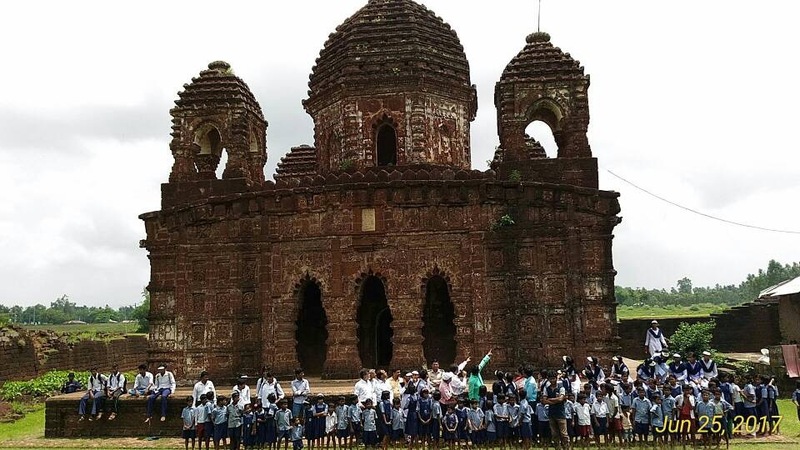 Here a guided tour was organised for the students to familiarize the architecture of various portions of the temple .It was now time for photo shoots to capture moments of this heritage fun feast . After a small break the group left for another unique five pinnacle temple with Fresco paintings inside. The paintings are almost faded but their brilliance is awesome. The programme ended with a question answer session and an oath to Save Local Heritage. A future roadmap was also drawn to create local heritage watch groups and Heritage club amongst school children. The rally ended with the vote of thanks by the BDO and a plan to organise similar rally to evaluate the changes by the next quarter.